Towards the end of April of this month we will have the 1st year anniversary of the opening of the Free Farm Stand and I am starting to look back and evaluate how things have gone so far. I want to see what I have learned and if there are any changes I should be making in what I am doing. This Saturday I had a mini-realization that I can’t always count of getting free left over produce from the farmers market (this week there was very little for some reason and there will be little next week too). I was wondering as the economy gets worse, will there be less free food to hand out? I was starting to get a little anxious like I did when I first started the stand that I wouldn’t have much to give out to all the people showing up these days. Then I thought in reality I can only grow so much food (unless I somehow manifest a small farm in the city…see the end of this article) and other people will only have small amounts of extra produce from their gardens that they can contribute. I reminded myself that I am not trying to run a food program exactly, but to be part of the movement of people encouraging local food growing and sharing (though I must admit I have that tendency to want to do serve large numbers of hungry people). One thing I am able to produce a lot of (though it takes some work) are vegetable starts or seedlings. Thinking this I went into greenhouse day dreaming mode. More on where that led me later on. In a separate bowl mix corn flour with water gently stir it into simmering corn stirring constantly so it doesn’t stick. pour this into the porridge mixture and simmer awhile constantly stirring. I have a new friend and garden apprentice I mentioned before, a ten year old boy name Zeus who came and helped potting up seedlings to give away. He is filled with millions of questions and I had a hard time answering them all. He is so enthusiastic about gardening and it is very wonderful to see. His family gave us two bird houses they had built and some carrot seed. The table had some beautiful chard and greens from mostly the secret garden and a handful of herbs, some red celery stalks, and a handful of snap peas. Nosrat brought by a huge amount of herbs from his garden including fresh sage. It is nice to use fresh herbs in our cooking and for a lot of us it is simple laziness that we open jars to get our flavor instead of picking it from a kitchen garden, either from a backyard, community garden, or windowsill. There was a lot of baby romaine and radicchio from the farmer’s market. I must admit I have a prejudice against radicchio and if anyone out there that can turn me around on this with some fabulous way of using it I would love it (I am not much into bitters I guess). We also had a lot of bread that people like. I was most excited by the fruit on the table. We had 33lbs of navel oranges picked from a local tree that was hecka sweet and juicy. It was the first big harvest of the year by SF Glean (see web site link on the sidebar, though the site doesn’t have a lot of information on it now). Jonathan took the list of fruit trees that needed researching and lucked out in meeting the owner of the trees. He got permission to harvest the trees and we might get more in a the following weeks. Margaret (also on the gleaning team) came by with some beautiful lemons she picked from Holy Innocents Church and a little sign that explained where they came from which was a nice touch. Steve brought not only lots of chard seeds from his dad’s garden in Sonoma County, but also a bag of big Meyer lemons. I tried this week to put more attention into the plant giveaway table. We had a lot of tomato seedlings to give away plus cilantro and chives, plus a few miscellaneous plants like rhubarb and hummingbird sage. A friend brought over a collection of the healthiest looking tomato starts she had grown to share and the varieties were ones that I didn’t have. Our helpers talked to everyone that took plants to make sure they know how to grow it and to told them about the different we had varieties and other related information. We also put in a word about donating any surplus they grow to the stand. If we can get it together for next week we would like to have a flier in English and Spanish how to take care of the plant and grow it. We will start with tomatoes. There was so much happening this weekend with many gardening events everywhere across town. On Friday we had a good workday at 18th and Rhode Island. Our small crew built two trellises for tomatoes and planted 12 kinds of cherry tomatoes, mostly heirlooms. We also built one more potato tower. After that, Page and I went to the Secret Garden and planted three more towers. The potatoes are starting to grow in many of the towers we have planted (I think we have about 14 towers now planted in different places). On Saturday I heard the PDC class planted more stuff on the hill. On Friday evening I got an email from my friend Jonathan who was one of the people who started CELL space who has started cleaning up the vacant lot next to CELL on Florida and is resurrecting the garden that was there a few years ago. His project is called the Esperanza Sustainability Center and he seems to want to do everything you have ever heard of there in terms of sustainability, including a community garden (not divided into plots but to give to the food to those who garden and maybe to sell some to local restaurants), a nursery for “Propagation of edible fruit trees, native trees, medicinals and other plant starts for Urban Dissemination” (including constructing a quick dome greenhouse), workshops, and a performance stage. 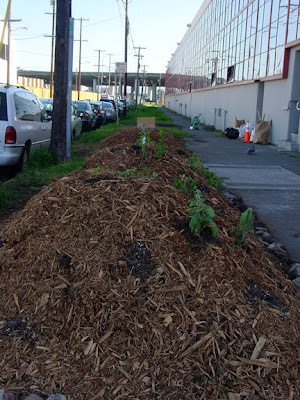 I went there on Saturday and there was a big 20yd pile of Bay View Greenwaste Management fine woodchip compost piled on the sidewalk. Sound familiar? It was sheet mulching day and I went off to help get a bale of cardboard from Whole Foods (while there the FARM project people that I wrote about last week was there doing the same thing (stuffing cardboard into their van for sheet mulching). When we got back, there were a whole lot of new people that I have never met ready to move cardboard and mulch. Two volunteers went off with me to pick up a load of horse manure and when I got back the place was hopping with energy and sweat. I stuck around for a while shoveling wood chips and then I took off to check out the sight at Hooper Street where the CCA students were sheet mulching the long strip of land next to their college building. I found the scene pretty inspiring and like I wrote to Robyn one of the organizers, to see a wasted piece of land being transformed like that is so inspiring to me. They actually got permission from DPW to do what they were doing. I just got word of a man in San Jose that has access to an acre of land in the middle of downtown that is flood plain and can’t be built on. He wants to grow food to give away, convinced we will have 18-22% unemployment soon. His project is a week old and says he needs all the help he can get. I wish san Jose was a little closer to the city. Thanks for your post, Tree. Do you know the info for the person in San Jose?